If you hate paperwork, the idea of a mortgage loan without forms is a dream come true. With the Internet, you can accomplish a lot of the work online. You will need to get everything ready, just as if you were applying in person. You will probably want to start with one of the many online mortgage calculators to determine how much mortgage you can afford based on your income and existing debt, the current mortgage interest rates, your down payment (assistance, too, if you're likely to receive any), and likely amortization, or how long it's likely to take you to pay the loan. Remember that the longer you take to pay the mortgage off, the more interest you will pay over the life of the loan. There's no way to tell for certain how much your mortgage loan rate will be ahead of time, but you can come up with a good estimate based on advertised rates. Take a close look at your credit record and make sure that there aren't any mistakes in it. Bad credit home loans are available but will cost you more, so estimate higher interest rates if you have bad credit. Once you are ready to apply for a mortgage loan without forms, you can start to find the right lender. You can try your own local bank or credit union, where you can get personal service and can often get a better interest rate as an incentive to keep all your bank accounts with them. If your credit card is from a full services financial institution such as Citibank or MBNA, you may also get a better rate from them. You can also look for mortgage companies like Wells Fargo or mortgage brokers. Even if you apply for your loan online, you will definitely want to communicate directly with the lender before applying. This lets you clarify any questions you may have or explain any special circumstances about your income or credit history. 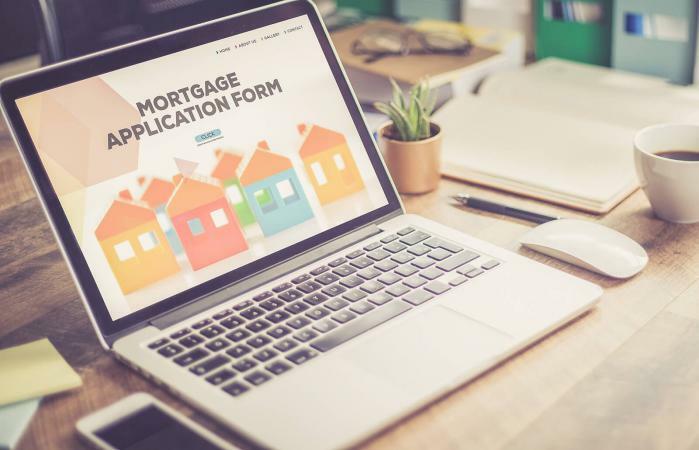 Remember, though, that even if you get information about rates or other terms related to your mortgage via email, nothing is binding on you or on the lender until you get the final loan agreement signed. You can receive a pre-approval after you apply for your mortgage loan. Getting your loan pre-approved can be a great help in simplifying your search for the right home. Pre-approval means that the lender has looked at your financial situation and credit history and quoted you the maximum loan size that they are able to offer you. While this isn't a binding agreement, it does assure the owner of the home that you want to buy that you can indeed afford it. Many home sellers are reluctant to accept an offer if you haven't been pre-approved because they don't know for certain whether you will be able to follow through and make the purchase. Once you've chosen a home and made an offer, you'll send the information to the mortgage lender. The lender will check the home's value to make sure that it's worth what you're spending on it. This protects them in case of a default so that if you're unable to pay, they will not lose money when they sell the home. The lender and you will then finalize the agreement and the home now belongs to you. Not every mortgage loan applicant has the documentation needed to apply for a traditional loan. Those who are self-employed, freelancers, consultants, and others may want to consider a no- or low-documentation loan. Although the name says no-doc, some of these loans may actually require more documentation than a typical mortgage loan. A stated income mortgage, for example, requires borrowers to illustrate their earnings with documents such and profit and loss statements, tax returns, and bank statements. No ratio and No Income No Asset (NINA) mortgages, on the other hand, truly require very little documentation. These two no-doc mortgages ensure great privacy, but can be more costly than a traditional mortgage loan. Also, no- and low-doc mortgages are typically only available to those with the highest credit ratings. Ask your mortgage lender if you feel this type of loan may be right for you.